Enter Matt Rainnie as the artist formally known as Prince. The well-known CBC broadcaster and performer joins a stacked cast this Christmas for Confederation Centre’s holiday musical, Robyn Hood: This Tale’s Even Fairlier. Rainnie plays bad boy Prince John, the tousle-haired tyrant of Sherwood-Parkdale Forest, and foil to Robyn Hood (Maria Campbell) and her Fairly Merrily Men. Prince John rules the Island with an iron-fist, taxing the poor and scheming to contaminate their water and construct a wall around the entire province. The Adam Brazier-directed musical is penned by Graham Putnam and Brazier, and plays select dates, December 9 – 17. Rainnie joins a fun-loving ensemble of theatre pros, Holland College/Confederation Centre School of Performing Arts students, hobby actors, and emerging talent of all ages, including Charlottetown Festival veterans Jessica Gallant and Alana Bridgewater, fellow Islanders Sarah MacPhee, Jordan Cameron, Nadia Haddad, Lexi Durant, Cameron MacDonald, Fraser McCallum, Tamara Gough, Ellen Carol, Al Baldwin, Ken Williams, and dozens more. Rainnie is the host of CBC Radio One’s popular P.E.I. morning show, Island Morning. Active in the community, he has also hosted countless charitable events across the province and remained connected to the local theatre scene where he was a founding member of Sketch 22, and cast member with Annekenstein and the improve comedy quartet 4Play. The broadcaster began his career with CBC PEI in 1993. He was a TV reporter and journalist before finding his home in radio. For several years, he hosted and produced the afternoon show, Mainstreet. During that time he was occasionally guest host of Sounds Like Canada and Weekend Mornings, and was host and producer of the national summer program, Lost and Found. He has also worked as a film reviewer for CBC across the Maritimes, as a writer for stage and screen, and in animation voice-over. He lives in Charlottetown with his wife and three children, two of whom will join him on stage in Robyn Hood. After the tremendous attendance of the first two performances earlier this month, Watermark Theatre is pleased to announce that we will be adding two more performances of the Cat’s Pajamas Theatre Company’s production of “The Ugly Duckling” on August 23rd and 25th at 10:00AM. The Cat’s Pajamas is a theatre for young audiences company created by Rebecca Griffin, a Holland College Theatre Performance alumni (2014). 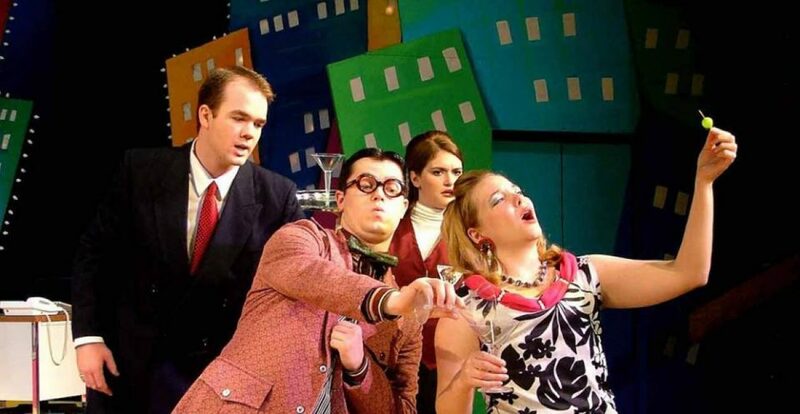 To this date, the company has produced three shows at The Guild theatre in Charlottetown. With the help of actors Kaitlyn Post and Jacob Durdan, and director Sarah MacPhee (all Holland College alumni as well), The Cat’s Pajamas Theatre Company is slowly, but surely moving up. The Ugly Duckling is an adaptation of the classic tale written by Pamela Campbell and Nancy Beck. This quick production is jam-packed full of music, comedy, and a plethora of barnyard characters. Sure to be fun for all! Kaitlyn Post is originally from Sussex, New Brunswick. You can also find her performing in Feast Dinner Theatre’s production of Scandalous at The Rodd Charlottetown. Becca Griffin is a mainland native, but an islander at heart. She’s worked with various theatres across the Island, especially the Victoria Playhouse, appearing in a few of their Norm Foster pieces. Hailing from Saint John, New Brunswick, Jacob Durdan has performed in many Island productions, including Cinderella: A Fairly Tale, Aladdin: Another Fairly Tall Tale, and Ladies and a Gent. Watermark is thrilled to be able to host this classic family show and help support a local theatre company. At Watermark Theatre, 57 Church Hill Ave. North Rustico, PE, C0A 1X0 All tickets are $10.